OK—I lied.. the post about heels will have to wait! 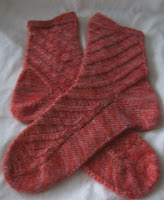 First off, today is First of the month Free-Be, and second, the Red Ribbon socks are finished. EZ was the Opinionated knitter; Anne Zilboorg is the the Knitting Anarchist; Anne Modisett is the Knitting Heretic—Me? I am the Imperfect Knitter. 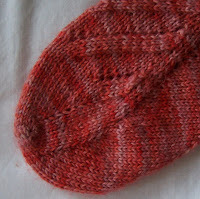 The Red Ribbon sock –an experimental sock is a perfect example of my Imperfectionist tendencies. It's not a perfect sock. It's serviceable, (and I will wear then) but the design is imperfect--and there are some imperfections in the knitting too! I am not a knitter who frogs, and frogs, and frogs again until I get it perfect—I don't aim for perfect.--small imperfections are perfectly OK with me. This sock has LOTS of wonderful qualities, --but some, mostly æsthetic, flaws. Take the toe... It's rooming and comfortable, but flat (and on the foot), the tip 'rolls' forward. And this is not æsthetically pleasing. The Heel looks misshaped—but actually is amazing comfortable on foot—a series of hidden increases add ease where it is needed, and the center back decreases pull the sock tight over back of the heel. Carrageen is a pale yellow seaweed (that dries to a creamy white) that is harvested of the coast of Ireland, in the dark blue sea. The carrageen has ruffled leaves, and the sea is often choppy. The pattern captures the rich, deep colors and the motion of sea and seaweed. Like the sea, different yarns, create different effects—but don't feel you have to limit your self to blues.. this textured stitch works well with many color ways, and creates a deeply textured diagonal scarf. Finished size: apx 10 inches by 45. 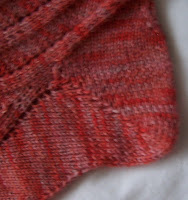 Use a needle appropriate for the yarn—the fabric should be open and drapy. Row 2: Knit in front and back of first stitch, K1, *P2, K2*, end last repeat with K2tog. Repeat rows 1 and 2 until desired length. The pattern stitch will be hard to recognizable a textured yarn, but contributes a deeply textured, random quality to the surface. With smooth fine yards, texture at first seems random. The wrong side is Purl the knits, and knits the purls. Worked in brown earthy colors, the result is something like plowed fields, worked in blues and greys, it's like a pebbled beach—in bright colors, it could look like a field of wild flowers.